When we think of winter, we think of ice and snow and snuggling–and there’s plenty of that to go around in author Sharon Gibson Palermo’s newest picture book, Winter, Winter, Cold and Snow. This gentle “call and response” or “question and answer” book opens with the narrator asking a full-breasted Chickadee to tell what it knows about the forest. The Chickadee begins by discussing fat, furry Bear, who is all curled up in her den, waiting for spring. From there the narrator asks Bear who she knows, and she discusses Beaver, who glides smoothly beneath the ice, on his way to his warm, cozy lodge. Next come a steady stream of animals, hungry Deer munching twigs from a tree; snowy Rabbit sitting still and quiet so that he doesn’t become anyone’s dinner; and Owl, who hunts all night and rests during the day. As each forest animal takes turn to tell what he or she knows about other animals in the forest, the story loops back to dear Chickadee, who sits quietly on her branch watching all the stories unfold. 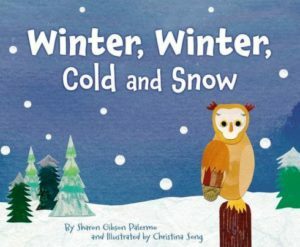 Using sweet and brief sentences that are perfect for pre-schoolers, Ms. Palermo weaves a winter-quiet story about forest animals seeking warmth and a good snooze in their homemade shelters. Artist Christina Song (isn’t that name perfect for this book??) offers soft pastels, kid-friendly forest animals and as-far-as-you-can-see blankets of snow to fire young children’s imaginations. Use this book to discuss forest animals, sleeping habits, animal instincts–or simply to coax your little one to snuggle up and take a nice, toasty mid-winter’s nap.